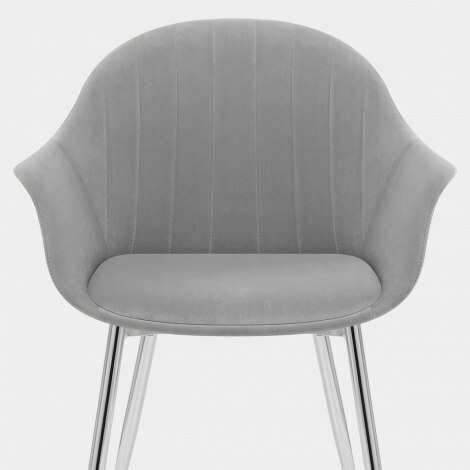 Introduce a stylish flair to your interior with the Flare Dining Chair Grey Velvet, an accommodating piece with a retro design. Crafted with an incredibly versatile look, the Flare will make a statement in your dining room, living room, study, and more. Upholstered in gorgeous grey velvet, the seat has an indulgent design with stylish flared armrests and a feature seat pad. Fashionable detail is added with vertical stitching in the backrest, which is comfortably padded. Supporting the seat is a frame comprised of four mirrored chrome legs. Tapering to the floor in style they each feature a protective pad on the underside to help reduce the risk of damage to floors.